As I mentioned before I'm a bit of a vacuum snob, I'm very picky about what type and brand of vacuum I use. I'm not going to use something that doesn't pick up all the little stuff. It just drives me crazy when I spend my precious time sweeping only to look back and see small debris still on the floor. And I'm not going to use something that might damage my hardwood floors. I've actually had a vacuum scratch my floor because it wasn't made for hardwood flooring. With kids and pets I'm all the time sweeping up messes and need something I can rely on and trust. I think that's why I like Shark vacuums so much. It's a brand that focuses on making cleaning easy and efficient for both carpets and hardwood floors. I actually have a Shark vacuum on each level of our tri-level house I love them so much. Having a sweeper basically within arms reach makes it so much more convenient. The latest Shark I added to my household is the Shark Rocket Complete with DuoClean Technology. It's probably the most unique looking vacuum I've ever owned. Instead of having a big canister or body it has the motor and cord all at the top of the handle. I was actually quite surprised at how easy it was to use. And with nothing extra around the head of the vacuum I'm able to easily sweep under tables and chairs. 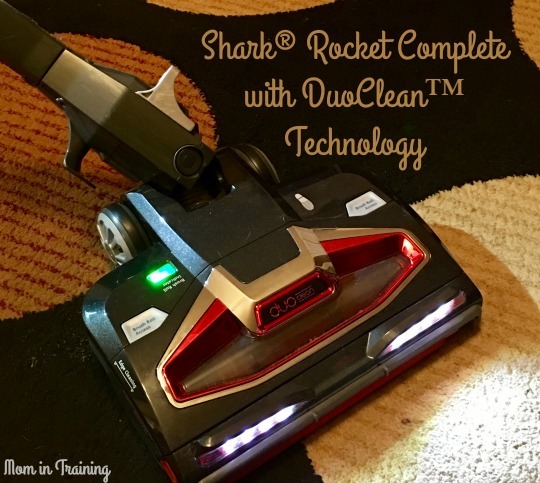 The Shark Rocket Complete even converts into a handheld vacuum making it super easy to go from cleaning floors to furniture and even ceilings! With the dual brushroll technology it picks up even the smallest particles from my hardwood floors and rugs with ease. It even picks up debris along the edges super close to my kitchen baseboards. I have to say I love that feature with the holidays right around the corner. I know we will be having family and friends over for dinners so I'm all about those clean baseboards! • Shark’s most technologically advanced ultra-light upright, provides remarkable floor to ceiling cleaning and obliterates embedded dirt and stuck-on dust, while providing improved flexibility. • With Triple Particle Cleaning designed for an incredible clean, the new dual brushroll system automatically transitions from floors to carpets. • With two brush rolls working together, the Shark Rocket Complete with DuoClean Technology picks up large particles, small particles, and stuck-on particles — on all types of floors and carpets. • Powerful LED lights on the hand vac and nozzle to spot hidden debris. • Fingertip controls for optimized carpet and bare floor cleaning. I could really use this to clean my new condo! This looks like a fabulous cleaning machine! It has great features. I'd love one of these! The fact that it can do carpets or bare floors is great. I would love to have this to clean our house! It looks like it would make the staircase a lot easier to clean! This has really nice features! I'd love to try it in my house! I've been looking for a new vacuum and this one has awesome features. I love that this converts into a handheld vacuum. Would be easier to vacuum stairs, furniture and drapes. Thank you for the review. I love the fingertip controls! Thanks for sharing. It looks like a really great vacuum. Unfortunately, I've owned two different Shark products and was extremely disappointed when both stopped working within 6-10 months. I have two cats, so I could really use this! It's wonderful what they come up with nowadays. Oh I have to say that look so nice! I would love one! I love how you can do so many different areas including the vents and curtains too! I love how you can easily use this for so many things- up high, in corners, on the couch, on stairs, etc. This looks like a great vacuum. I have the Shark Lift Away and I love it. It sounds like this vacuum rocks. I also hate vacuums that don't work very well, which it seems to be a very common problem. It looks very versatile and easy to use. My wife does most of the vacuuming, so I'll have to tell her about this particular vacuum. If it can save time and money, I'm all for it.